Pharyngeal "throat" teeth are located on the last gill arch at the posterior region of a fish's head. They are visible only upon lifing off the gill cover (operculum) and exposing the gills beneath. 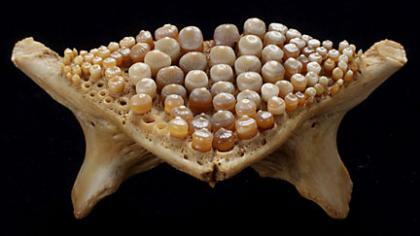 The arrangement and number of these teeth are specific for certain families and species of fish. Shown here are those of the freshwater drum or "sheepshead." They are considerably larger than those of other fishes native to Minnesota. For more information on the freshwater drum in Minnesota, see the Minnesota Department of Natural Resource's Nature Snapshots page.